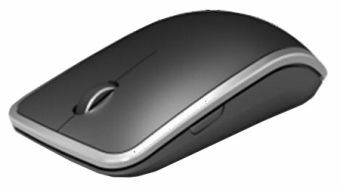 The WM514 Wireless Laser Mouse from Dell™ is a stylish, high-precision wireless Windows® 8 mouse with a long battery life. Its laser tracking feature allows for smooth tracking on virtually any surface and provides quick response times and accurate clicking. Now experience a clutter-free workspace with wireless performance that allows you to have all of the expected conveniences of a mouse. This mouse is designed for comfort to allow users to work or play for longer periods without the usual stress on the wrists or hands. The mouse is a breeze to set up and allows you to simply plug in the dongle and get started right away, with no software required. The compact size makes this mouse a great option for the mobile professionals. This product has been tested and validated on Dell systems. It is supported by Dell Technical Support when used with a Dell system. У кого длинные пальцы, будет не очень удобно, так как она не большая и рамка по периметру. Качество отличное, работает хорошо.